Founded in 1890, the University of Oklahoma first comes to mind when one typically thinks of Norman, Oklahoma. The university was fortunate enough to have a guiding Masonic hand in its infancy. David Ross Boyd was appointed the first President of the University of Oklahoma and his legacy can still be seen across the Norman Campus today. [viii] During his tenure at the university, Boyd also enjoyed the brotherhood of Norman Masonic Lodge. Norman Masonic Lodge presently resides at 1700 North Porter in Norman where it meets in a beautiful Masonic Temple. The building was erected in the early 1970s. One of the principal forces behind the construction of the new temple was John Wesley Preble, who served as Grand Master in 1973. [xiii] Prior to the completion of the new temple, Norman Masonic Lodge met at the 200 block of East Comanche in Norman, next to what is the present day office of the Norman Transcript. As Masonry began to grow in the newly formed State of Oklahoma, a variety of other Masonic Orders began to establish their presence. 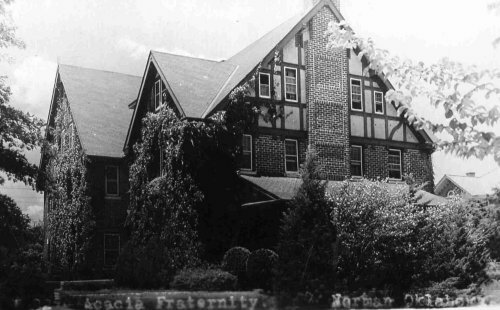 On March 12, 1898, Lion Chapter # 24 Royal Arch Masons was chartered and attached to Norman Masonic Lodge, though the name would later change to Norman Chapter in 1928. [xiv] In time, a Council of Cryptic Masons and a Commandery of Knights Templar were chartered in Norman in 1914. Today, the Norman Masonic Temple is not only home to these York Rite Bodies but also the Order of the Eastern Star, the Order of Amaranth, the Order of the White Shrine of Jerusalem, DeMolay International, Job’s Daughters International, and the International Order of Rainbow for Girls. Founded in Indian Territory, helping to form the first Grand Lodge of Oklahoma, and then participating in the union of the two Grand Lodges, Freemasonry in Norman has weathered the storm and the brethren of Norman Lodge #38 AF&AM have left a lasting mark on "Norman’s Camp." [i] “Our History,” City of Norman, <http://www.ci.norman.ok.us/our_history.htm>, Accessed 4 Oct. 2009. [ii] “A Brief History of the Most Worshipful Grand Lodge AF&AM of the State of Oklahoma,” Grand Lodge of Oklahoma, <http://www.gloklahoma.com/about.aspx>, Accessed 4 Oct. 2009. [iii] Grand Lodge of Indian Territory, Charter, November 5, 1890, Private Collection, Norman Lodge #38, Norman, Oklahoma. [v] Grand Lodge of Oklahoma Territory, Charter, December 3, 1892, Private Collection, Norman Lodge #38, Norman, Oklahoma. [vii] Grand Lodge of the State of Oklahoma, Charter, February 11, 1909, Private Collection, Norman Lodge #38, Norman, Oklahoma. [viii] “David Ross Boyd,” Oklahoma Historical Society’s Encyclopedia of Oklahoma History and Culture, <http://digital.library.okstate.edu/encyclopedia/entries/B/BO030.html>, Accessed 4 Oct. 2009. [ix] “The Masonic History of Hal Muldrow,” The Muldrow Newsletter, <http://www.dallas.net/~mcmanus/muldrow/2k_3/m2n3p3.htm>, Accessed 5 Oct. 2009. [x] Charles Evans, “Henry Lowndes Muldrow,” The Chronicles of Oklahoma 4 (January 1951): 397. [xi] Grand Lodge of the State of Oklahoma, Cornerstone, November 16, 1909, Evans Hall, University of Oklahoma, Norman, Oklahoma. [xii] Keith Bushey, Assistant Executive Director, Acacia Fraternity, Telephone Interview, October 7, 2009. [xiii] “Past Grand Masters,” Grand Lodge of Oklahoma, <http://www.okmasons.org/past-grand-masters.aspx>, Accessed 5 Oct. 2009. 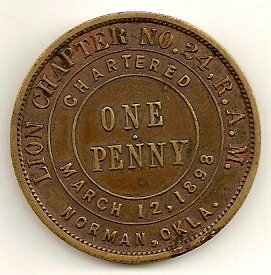 [xiv] Lion Chapter #24 Royal Arch Masons, Chapter Penny, March 12, 1898, Private Collection, Trasen S. Akers, Norman, Oklahoma.